This sweet and spicy Asian cucumber salad is a quick and easy side dish. It's cool and refreshing, cucumbers are the perfect accompaniment to anything intensely spiced (not necessarily hot). Slices of cucumber are paired with Asian seasonings like mirin, rice vinegar, and sesame oil, all of which should be available in your local supermarket. Serve your sweet and spicy Asian cucumber salad with grilled meat for a delicious meal. Combine ingredients in a bowl and marinade for 30 minutes. Serve chilled. 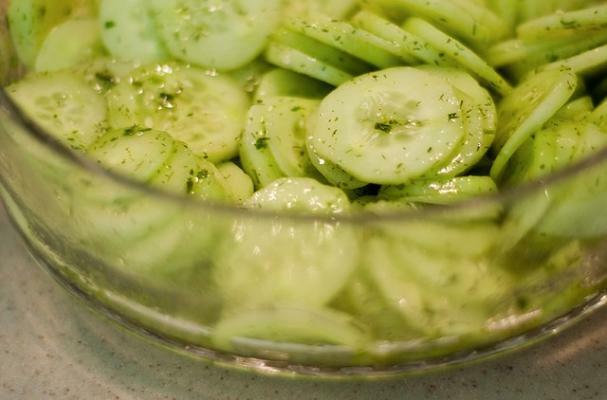 After you slice the cukes, place them in a strainer in the sink sprinkled w/ a little salt. Leave for 30 min. Other cucumber salads have this step so it's worth a shot. I agree! I couldn't get the marinade to "stick" to the cukes... so I am going to try adding the salt in a strainer and addinf sugar. anyone else have any solutions? There is nothing about this recipe that is "sweet" I even added 1 Tablespoon of sugar. The sesame oil is to overpowering and it needs to be equal parts oil and vinegar to make it "stick". I salted and dryed my cucumbers and the was a huge help. There is not enough chili sauce to even taste, I ended up adding more. This recipe is a hot mess!